Buy Local! Buy Fresh! And where else but at a local farmers market. 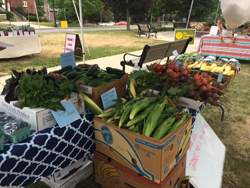 The Pioneer Valley is home to some of the longest running farmers markets in the state. 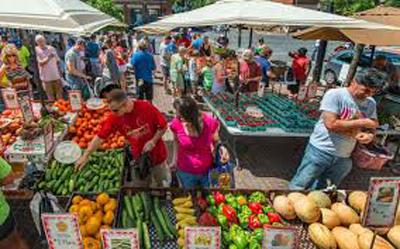 The Amherst Farmers Market, the Greenfield Farmers Market, and the Northampton Farmers Market are over 40 years old. Our farmers markets are an important source of commerce and community building for both farmers and residents. These markets carry an amazing array of local products. 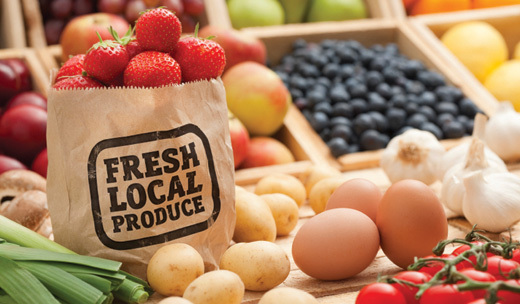 At a farmers market you can find vegetables, flowers, meat, fruit, jam, fresh bread, baked goods, crafts, and more. Bring your kids; there are things for them to do. Listen to music as you stroll from table to table. Grab something to nibble on while you shop. WMMGA has tables at several of the local markets. 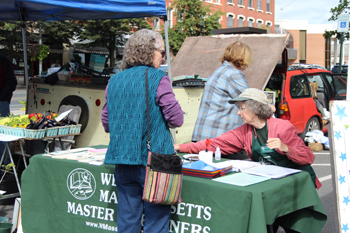 Master Gardeners are there to answer your gardening questions, provide factsheets on plants, diseases, and pests. We even have some fun games to test your and your children's gardening knowledge. Check out our "Roadshow" boards. Each board displays information on a different gardening topic.